Hello, everyone! 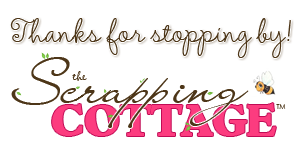 So glad you stopped by the Scrapping Cottage blog! 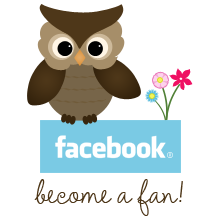 This is Bev Polen from Guneaux Designs, and I am a guest designer for today! 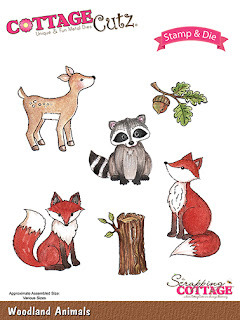 The project I have created for you features the wonderful stamps and dies from the CottageCutz Woodlands Set, CottageCutz Woodland Animals Set, and the dies from the Rustic Sign & Trees. I had so much fun creating this card, and I hope you enjoy it. 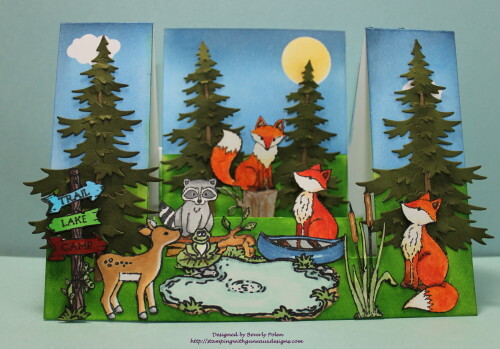 I love the gorgeous fox images and dies from the CottageCutz Woodland Animal Set; therefore, I had to add three foxes to my card. The little raccoon is so adorable that I planed to add two but there was not room on the card. 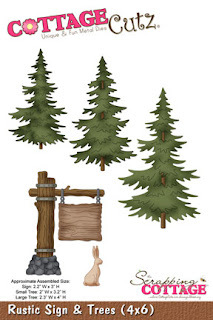 If you have not purchased the set yet, I promise you will have so much fun creating with it and the CottageCutz Woodlands Set. 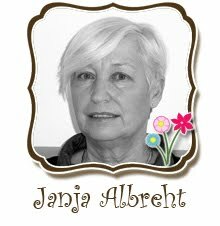 To create the card, I stamped, colored (with copics), and cut out the images I would use for the project. After die cutting the elements, I decided I wanted to fussy cut around them, which I did. Then I created a Step Ladder Center Cut Card with white card stock, and sponged on it a sky, sun, and grass. It was then time to load up the card with the critters. What fun!! Cut a 7" x 10" piece of heavy card stock. 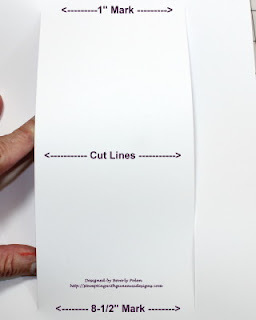 With the 7″ side at the top of a cutting tool (henceforth, trimmer), move the card stock to the left to the 1-5/8″ mark. 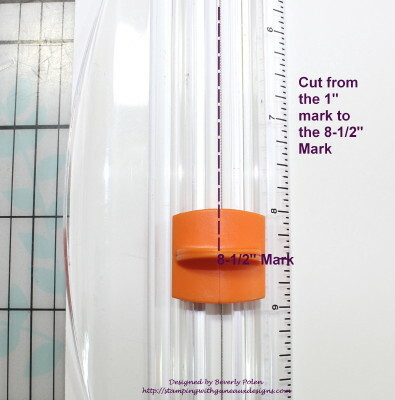 Move the cutting blade of your trimmer down to the 1″ mark and lower the cutting arm. Cut the paper from the 1" mark to the 8-1/2" mark. 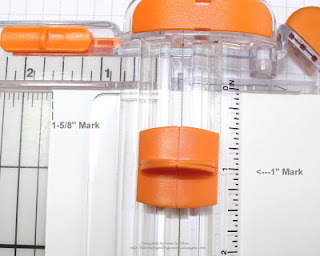 Turn the paper over (not around or the cut lines will not match), move it to the 1-5/8" mark on the trimmer, move the cutting blade down to the 1" mark, and lower the cutting arm. Cut the card stock from the 1" mark to the 8-1/2" mark. 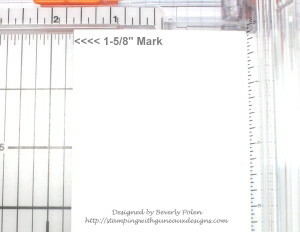 Place the card stock onto a scoring tool with the 10" side at the top. Ensure the 7" side that is to the left on the scoring tool is the one that has the cut lines 1" from the side. 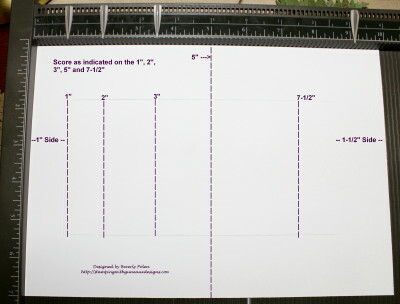 Score at the 1", 2" and 3" marks from the first cut line to the second cut line. Score at the 5" mark from the top to the bottom of the card stock. Score at the 7-1/2" mark from the first cut line to the second. 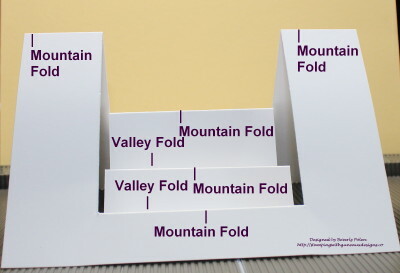 Now fold the card stock according to the following: a) 1" score line is a mountain fold, b) 2" score line is a valley fold, c) 3" score line is a mountain fold, d) 5" score line is a mountain fold on the two sides and a valley fold in the center, and e) 7-1/2" score line is a mountain fold. 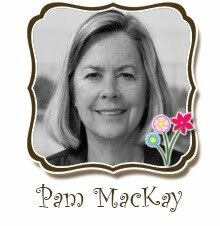 Decorate the card to your liking. 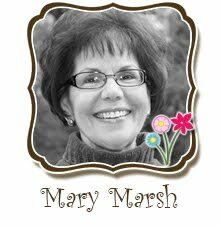 If desired and to support the elements placed on the back step (mountain fold), cut a 3-11/16" x 4-7/8" piece of card stock and attach it to the back step on which you can add your primary feature. 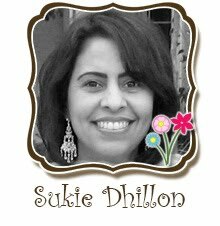 I added this piece to my card. I hope you will try this card fold and use the CottageCutz dies found at the Scrapping Cottage to showcase. 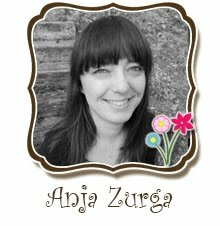 Come back tomorrow for more beautiful crafting projects! 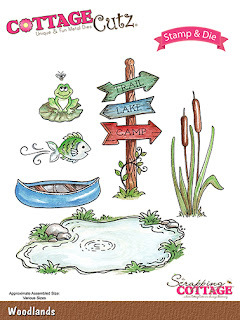 Bev - What a great scene you have set with this card and your coloring is well done! I haven't thought of putting a piece of cardstock on the back step before but it makes a lot of sense. Great ideas! I love how you made the scene and colored the animals. Very nice. Bev, this is just great! 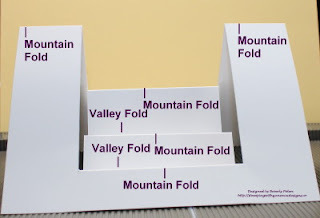 I love fun-fold cards, and this one is over-the-top clever. 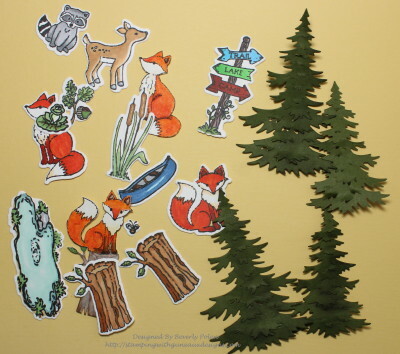 Your little forest scene is so cute. Such a beautiful card! I really like this woodland scene! Beautiful scene you have created. So elaborate and so well explained. 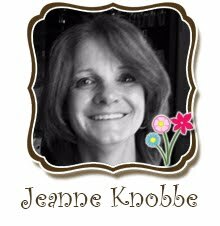 Awesome card love the scene you created!